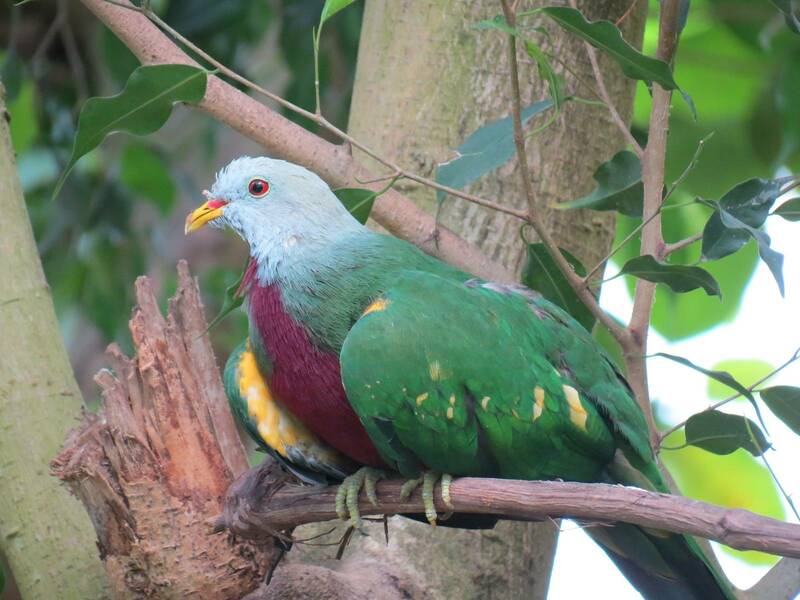 Today I want to write about one of the most colourful and strangely named birds in Australia, the wompoo fruit-dove. These beautiful birds are a kind of pigeon and grow up to 50 cm long. They are very brightly coloured, with a purple chest, green back and wings, yellow markings under their wings and a pale grey head. As their name suggests, they eat fruit, climbing around the rainforest canopy and swallowing large fruit whole. Despite their bright colouring, they are very difficult to see and are often only noticed from their call of “wompoo” which gives them their name. At breeding time, both the male and female help to construct the nest. Only one egg is laid and both parents help to raise the chick. Wompoo fruit-doves are found in tropical rainforests along the east coast of Australia from central New South Wales to far north Queensland and in New Guinea. They are quite common throughout their range. Are there any other interesting facts that you would like to share about wompoo fruit-doves?